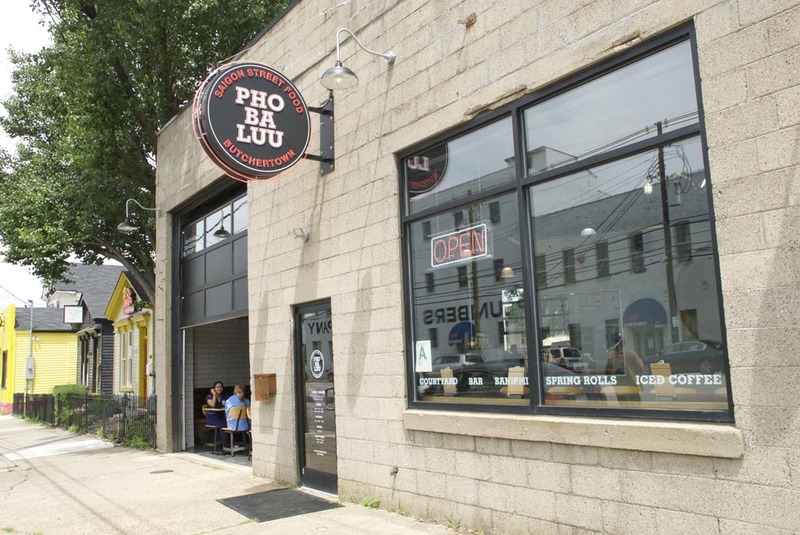 Located at the edge of Louisville’s Nulu District in the historic Butchertown neighborhood, the building that is now home to our restaurant PHO BA LUU got its start as ABC Welding & Repair, owned by Burkhardt John Zoeller, Sr., who built the odd shaped cinder block building at 1019 East Main Street soon after the end of WWII in 1945. In fact, the site once housed three separate buildings. A brick shotgun house once stood at 1017 East Main Street, occupying nearly the entire length of the main dining room, while a frame shotgun house stood at 1019, essentially where our open kitchen now sits. A two-story frame carriage house stood out back, approximately where our fire pit is now. These structures all made way for what is now 1019 East Main Street. Burkhardt Zoeller operated ABC Welding & Repair as a service garage for large trucks from the 1940s until about 1994. The Bethlehem Steel forged beams that still sit atop the cinder block support columns were once used to lift truck chassis to allow access for necessary repairs. Burkhardt’s hand is still evident in our current restaurant design. The same large garage door openings that once allowed semi tractor-trailers to drive into the building from the alley, and then after servicing, exit onto Main Street, still exist at the same scale as when he first imagined and built them. We also kept the large window openings that immersed the garage in natural light and continue to do so today. We managed to salvage and weld together eight original windowpanes that are now the mirror behind the bar. We also restored Burkhardt’s original skylights, an innovative feature ahead of its’ time, that perfectly suit our modern, minimalist decor, while at the same time complement todays conservation minded design standards. We think Burkhardt would be envious of our powered garage door openers and proud of our state-of-the-art industrial style LED lighting. The German tables in our courtyard are a not-so-subtle nod to Burkhardt and his – and Butchertown’s – German heritage. We can easily imagine that Burkhardt would have, after a long day, treated his crew to a cold beer in what is now our very own German inspired beer garden. Burkhardt Zoeller was a member of the Worthington Volunteer Fire Department and lived to the age of 94. We have learned what we can about BJZ and hope to learn more if one or more if his four children, nine grand children or seven great grandchildren happen to walk in one day for a bite to eat or maybe to have a beer out back.